A fuzzy view of afternoon discussions in the lab. As seen by the ZEB-REVO in double quick time. 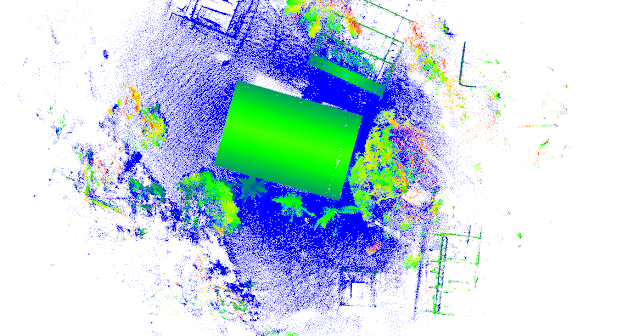 Paracou field station, from lidar from above. It's been a fantastic week - a real privilege to be invited and to catch up with some old faces, and meet many more new, particularly the incredibly bright and enthusiastic participants. It's certainly provided food for thought for me, even if that isn't the main aim :-) I've seen new work on demographics, different ways of considering diversity & species richness, the wide range of conceptions of forest 'structure' (there's so many ways to look at it! 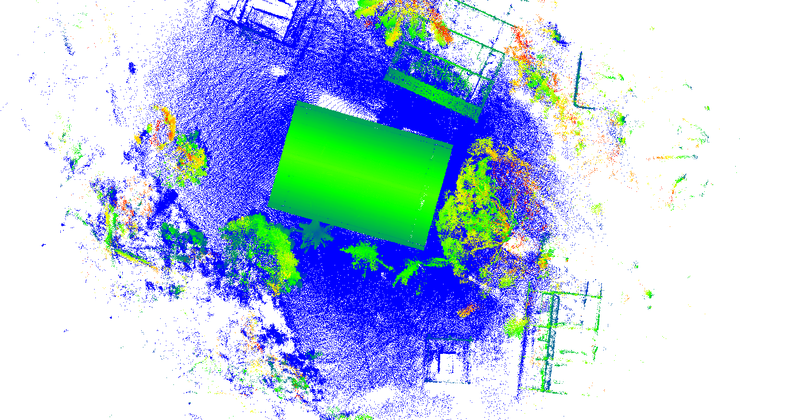 ), acoustic mapping, wood density and growth rates, overstory, understory, lidar, hyperspectral, modelling and on and on. I can't wait to follow some of this up. The one downside? During a day visit to see the work at the long term Amazonian tropical field station and Guyaflux tower at Paracou, I managed to pick up some very unwanted and irritating passengers in the form of Trombiculidae, or chiggers. Aaargh. 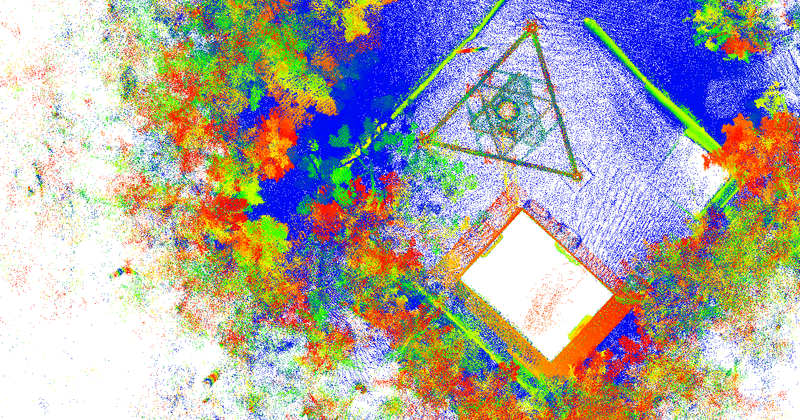 Lidar view of the Guyaflux tower at Paracou. As a serendipitous bonus, we were lucky enough to get a last-minute tour of the Ariane spaceport just up the road (the main industry around here), the day before a scheduled Ariane launch! This had been delayed from a few weeks ago, apparently just for our benefit, on a balmy Friday evening. Sitting on the beach with the sun going down behind us and watching a spectacular launch was a fitting end to a great week. Props to Jérôme, Grégroire and Jessica (the tireless organiser) for sorting that out. The only slight hiccup was the small earthquake yesterday morning which surprised us all - no harm done though. 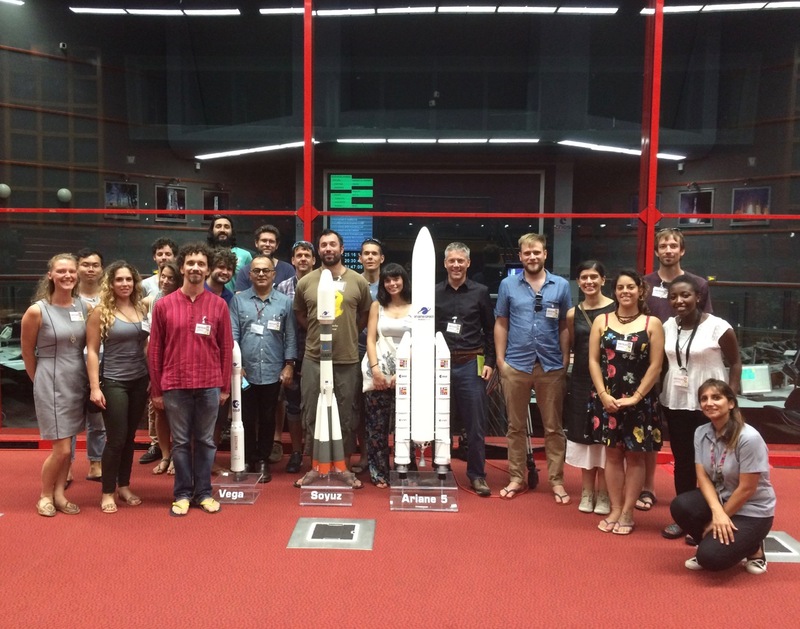 The gang - at the space centre. I get a cricked neck just looking at this! The tree is ~80 m tall, and 16 m across the crown. Phil generated a first estimate of the volume which suggests it's ~80 m3, meaning it weighs about 40 tons! 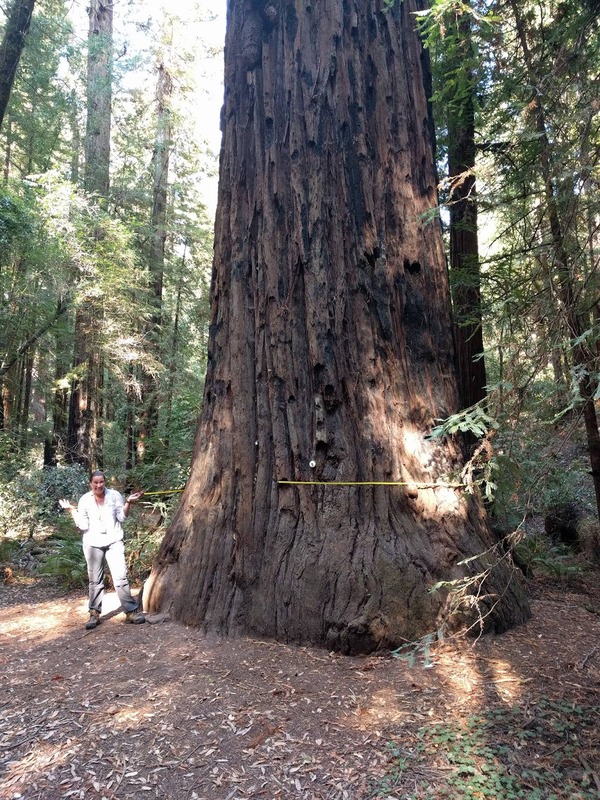 And 50% of that volume is in the lower 20 m of the trunk, perhaps unsurprisingly given its shape. Meanwhile, here's a great example of Dave's 14 GoPro 360 photo setup. Can't say we look good, but the trees certainly do. Remember, never go full lumberjack Andy. Dave developed his Terrestrial Recording of 3D 360 Surveys (TR33S) system under funding he was awarded through the Universities Space Research Association (USRA - Columbia, Maryland) Internal Research & Development Program. 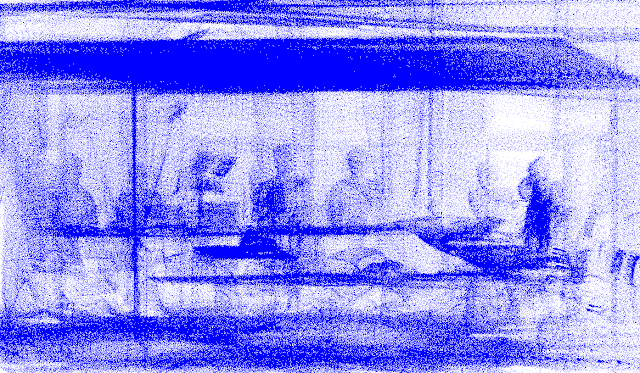 The TR33S collects pictures in every direction by linking the 14 cameras together. The 360 photos are great, but more generally Dave is aiming to capture 3D point clouds using structure-from-motion (SfM). SfM is a photogrammetric technique that can model a 3D space from 2D images. It's widely used for UAVs but this is the first time I've seen it used like this, and there are some potentially great applications in forest research like this! Dave has written about his work with the camera on the NASA blogs: Below the Mangrove Canopy; and Mangrove Carbon With a Grain of Salt. ... or so my kids have told me. Andy and I have been having an amazing time scanning here in CA, with our NASA/UMD colleagues Laura Duncanson, David Lagomasino, and John Armston. We've managed to scan 8 x 0.25 ha plots as part of the NASA Carbon Monitoring System project, following Laura's protocol for the GEDI cal/val. The others have been measuring stems in 25 m fixed radius plots (i.e. 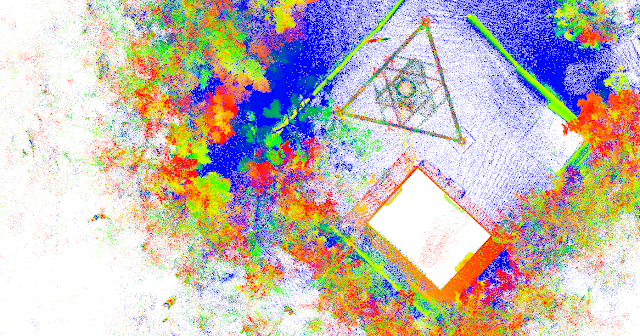 single GEDI footprint-sized) overlapping within each 0.25 ha. 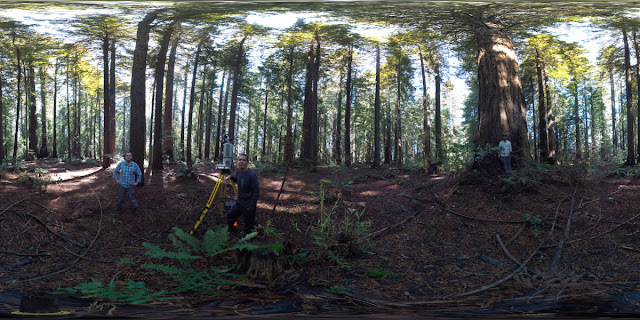 Meanwhile, Andy and I have been doing the TLS - 1ha in two locations, and then in Armstrong Redwoods State National Reserve, using smaller 0.25 ha plots due to the constricted nature of the site (paths, valley, road). These trees really are amazing. It's perhaps too easy to bandy around words like 'majestic' or 'spiritual' and so on, but there is something quite primal about being here. And amazing (and sad) to think that this whole area was covered with giants like this not much more than 100 years ago. Also incredible to think about the effort required to fell and remove one of these things, with nothing more than handsaws and some horse-powered carts and trucks. And a lot of labour of course. "That's not a tree maayte, THIS is a tree"
"We're going to need a bigger DBH tape"
Some of these trees are HUGE - approaching 100m tall and 4m in diameter or more. They have amazing structures, roots, fire damage and I literally can't stop looking at them - my neck hurts from looking up. 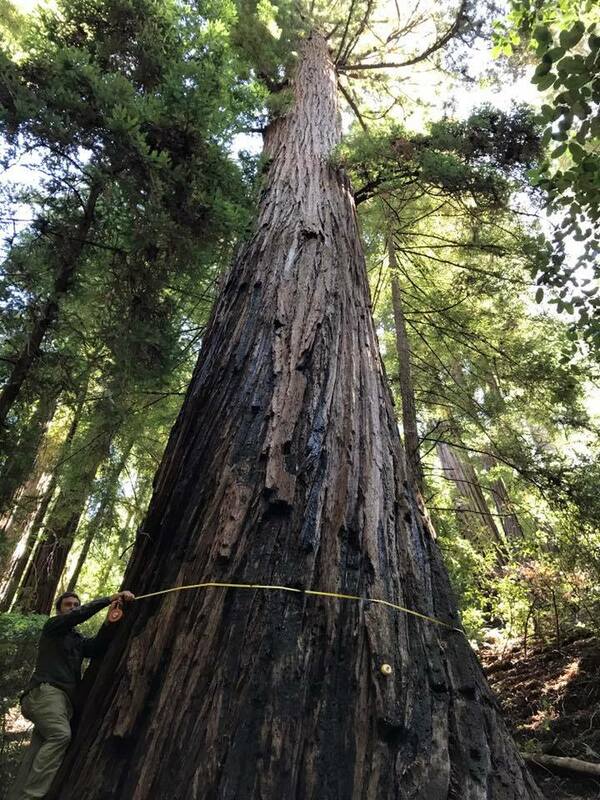 Interestingly, the largest/tallest trees as noted on the maps and guides may be taller/shorter than measured - we're waiting on the TLS to find out for sure. The recorded sizes are from 20+ years ago in some cases so that may explain some of the differences, but we already think we may have found a taller tree than the apparently tallest one, just off the beaten track a little bit. We'll see! Meanwhile, Dave was deploying his cool 14 GoPro 360 shape-from-motion-on-a-stick set-up. 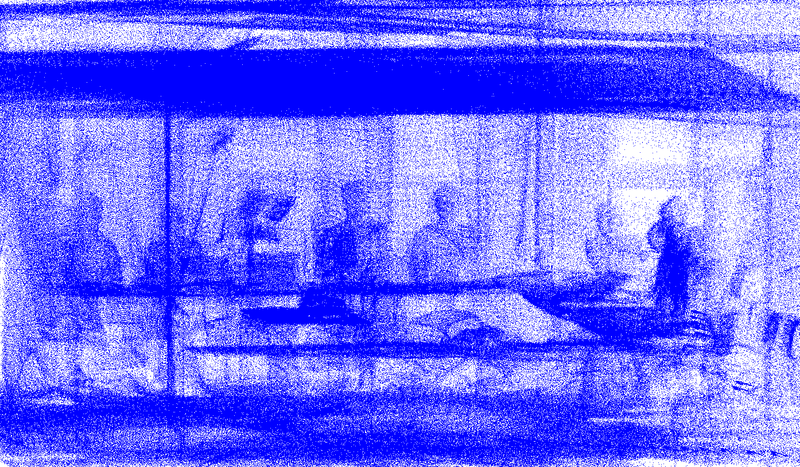 Here's a 360 picture of us in the plot from the system - but I'm really interested to see some of the point clouds from this. He's got some excellent results from mangroves, so this is a liiiiiittle different. I've even managed to rope the kids into doing some work - it's educational! Roots. Or as I like to call them "someone elses' problem". Andy in classic fieldwork with TLS mode. Never let people who aren't *doing* the TLS lay out the grid. Precarious. Strange fire history - possibly due to a large 19th C fire caused by an explosion from an illegal whisky still - but hard to see how (or if) that caused the scarring, other than the burn. It's been a stunning field visit and I can't wait to see the data. It will be fascinating to see where these very large trees sit on the allometry line - how variable they are and then to think about some of the issues of density and hollowness. One of the interesting things about working in a very public location like this has been the interest shown by people walking past. I've given the "Weighing trees with lasers! Carbon! NASA! Science!" spiel so often that the kids have started calling me Steven Spielberg. School groups, retirees, local cops & park volunteers, runners, walkers, cyclists - the response has been almost overwhelmingly positive. People have been interested, enthusiastic universally extremely supportive of what we're trying to do, particularly in view of the current political and funding climate. It's rare to get such instant, positive feedback on your research! People *are* interested in science, particularly if they can see it in action and you can explain why it's cool and important. So this time we've come to California, to scan the largest organisms on Earth, the giant sequoias of Northern California. And what a sight they are. I always find big trees can have an overwhelming sense of scale - perhaps it's their size, coupled with the often (but not always) wilderness of the surrounding environment. But these are genuinely breathtaking - and at 60+ m are actually on the small side. Next week, we'll be in a grove with some of the 100+ m real giants. I can't wait! Meanwhile, myself, Andy, Laura Duncanson and David Lagomasino from UMD, will be working here. Everywhere you look - just outside the front door. We're here as part of a NASA-funded Carbon Monitoring System project led by colleagues Lola Fatoyinbo and Laura Duncanson of Univ. of Maryland and NASA Godard, and Amy Neuenschwander, from the University of Texas. The project, Future Mission Fusion for High Biomass Forest Carbon Accounting, is using data from Gabon, Costa Rica and here in the US to help calibrate and validate estimates of C stocks from a trio of new spaceborne sensors which will be launcched in the next 2 years, GEDI, ICESat-2 and NISAR. With ESA's BIOMASS mission also being launched around the same time, there is huge potential for combining these complementary new observations to dramatically advance our understanding of forest state, structure and biomass. We're working with the GEDI and BIOMASS teams, using our TLS work to provide key new observations of biomass and structure in a range of forests, but particularly forests with large trees and high biomass. Providing better measurements of biomass and structure will allow the GEDI and BIOMASS science teams to test their retrieval algorithms, and potentially develop better ones. Even Andy is impressed by 3m DBH. A bit. It's a lovely place to work - not just the forest plots themselves, but the surrounding landscape of hills, vineyards, rivers, and the coast just a few miles away. Fortunately we missed the heatwave of last week - 43 C isn't much fun in anyone's book - the landscape is totally parched after several years of drought and low rainfall. I've hired a bike to ride some of the amazing roads in the early mornings. I mentioned to the hire guys that the forecast mentioned it might even rain. They laughed: "Hasn't rained in 6 months. It's not going to start now". This morning? I rode 40 miles and got absolutely soaked. But it was still beautiful - eerie and quiet up in the forest groves. At the risk of sounding corny, being among so many very old and very large trees and yet seeing so many charred, or rotting rotting hulks - remnants of even larger, older trees that were logged out and sold, does remind you of how fragile this all is. You can see why they were so attractive to the lumber men but once they're gone, they're gone. And getting a 2.8m DBH. We've had 3+ already. More pictures of the giants in Armstrong to follow. And David's cool 14 GoPro 3D camera setup, for capturing 3D data via SfM (niiiice! ).